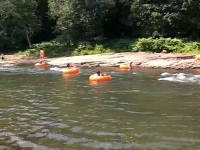 Go river tubing in PA at many great rivers throughout the state. Find recreational areas in the Poconos and other lovely towns and cities, where you can enjoy water tubing in PA.
PA Tubing 7 Days a Week! Open 7 days a week from 10 A.M. to 5 P.M., Coal Tubin' offers some of the coolest water tubing in Pennsylvania! Bring along the family and enjoy a fun and pleasurable tubing adventure that you won't soon forget. Weekend season and full week season passes are available. Children must be 5 years or older, in order to tube. All tube rentals include a shuttle bus and all day parking. Groups of 10 or more should call in advance to make reservations. Coal Tubin' also offers whitewater rafting when the water levels are high enough and fly fishing at the Stonycreek River.